Caroline with granny Maria Esposito. Almost everything Maria Esposito knows about cooking, she learned from her grandma who raised her back in Puerto Rico. She brought those cooking chops to the Bronx where adaptation was key. Now a grandma herself in Warwick, N.Y., Maria imparts her culinary wisdom to you wonderfully hungry viewers in this DOUBLE-DISH feature on pernil and arroz con gandules (roast pork and rice with pigeon peas) which includes fresh-picked greens from her garden. You’ll need to take a page out of her recipe book (in fact, you can once I finish up the “Cooking with Granny” recipe book!). Enjoy this mouthwatering episode! Caroline Shin is a multimedia journalist based in NYC. 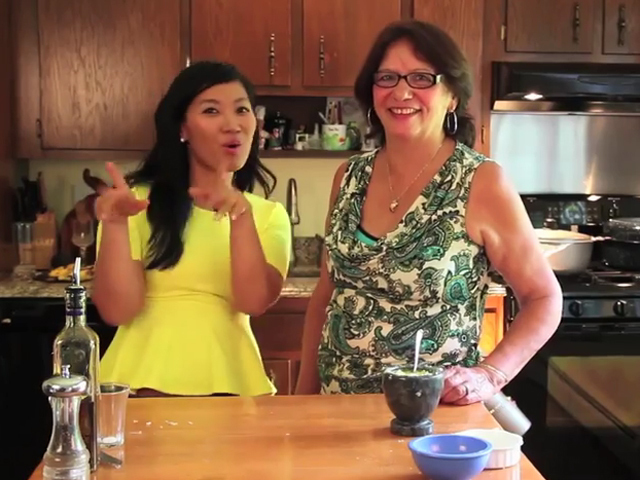 Recently, she launched “Cooking With Granny” – a Web series in which grandmas teach how to cook traditional dishes from their cultures while simultaneously sharing their funny, sad and surprising experiences with immigration and multiculturalism in a world that’s very different from today’s. Shin was previously a video editor at New York Magazine and holds an M.A. from Columbia Journalism School.